September 18, 2008 is a day that most children at the Norma Grey Early Learning Center in Huntington will not forget in a hurry, the reason being that two of their most favorite Pooh characters Winnie the Pooh & Tigger gave them a surprise visit. All Pooh characters were in town as part of 'Disney Live' Winnie the Pooh stage show that took place at Big Sandy Superstore Arena. Prior to their arrival, the Pooh storyteller Tracy Fisher held some activities for the kids such as painting flower pots. To allow the kids to have a far more real experience, various Pooh characters are visiting select cities to interact with young kids. Thereafter, the kids were taken to the play area and were made to hide behind the playground equipment. 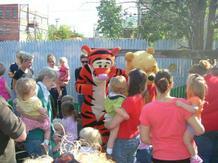 When Pooh & Tigger appeared, the kids just ran towards the two and hug and jumped all over Pooh & Tigger. Though some kids were a bit afraid, a large number of kids were really very happy. The Norma Gray Early Childhood Learning Center organized a carnival on Saturday from 2 to 6PM (October 11). Admission is two dollars and the funds raised through the event shall be used to create a new playground fence.